Stirring first, I eased back the light covers and slowly swung my feet to the warm, wooden floor. A light breeze from the open window above the bed brushed across my bare back, the last vestiges of night air mixed with the warm promise of a perfect August day. Two salt and pepper shadows trailed me through the living room, past the darkened pane of glass that would only later be allowed to connect me with the fire and brimstone of the outside world. The coffee pot had awakened to its task as I was finishing with my sleep, and the steamy aroma of the rich, black liquid silently drifted across the kitchen. The boys even ate their kibble quietly. No one seemed to want to interrupt the stillness. Hot cup in hand, I slid the heavy glass door open and stepped down to the terracotta patio that runs across the back of the house. To my bare feet, the irregular tiles were rough and cool, having given up the previous day’s heat to the night air. Barely lit from the left, I could just see shaggy outlines, as the boys trotted to the far edge and hopped down to the narrow strip of recently mowed grass that separates the patio from the garden. Shoulder to shoulder, they disappeared down one of the vegetable-lined paths. Beyond the garden, morning light glinted off the upper windows of the outbuilding, where the end of Dillon’s story waited to be written, vying for my attention with the half-finished harvest table in the workshop below. I sat at the round, mahogany table and gingerly set my cup down, still trying not to make a sound. 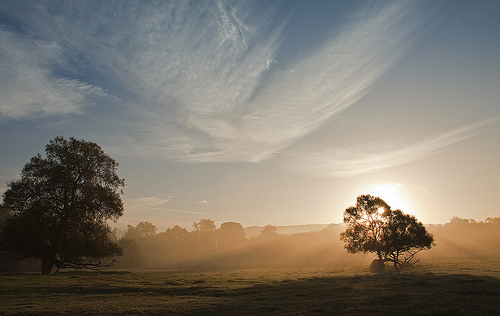 My eyes drifted closed, and other senses took in the gifts of a peaceful country morning. Sunlight filtered through the trees across the field to the east and bathed the side of my face with a hint of warmth. My fingers traced the smooth edge of the table, softly rounded with my router years before. The air moved and brought cut grass, coffee, and green smells from the garden, pleasant reminders of so many summers now past. In the stillness, my good ear strained to hear the first faint sound of the day. As it grew to a familiar whisper, only my eyelids moved, rising ever so slowly. An arm’s length away, a beautiful hummingbird hovered in the air, studying my careful smile. Her ruby head and green body were iridescent in the magical morning light, her beating wings almost invisible. My tiny visitor stopped time for an all-too-brief moment, and then she was gone. As if on cue, the boys raced out of the garden and bounded onto the patio, demanding their morning treats in a chorus of barks and whines. With the silence duly shattered, a perfect August day was fully at hand. Now that I’ve shared what my Glory Morning would look like, I’d love to hear from you. In your heart of hearts, how would you choose to start each day? Many athletes have pre-game rituals so why can’t authors have pre-writing session rituals, too? I certainly do. 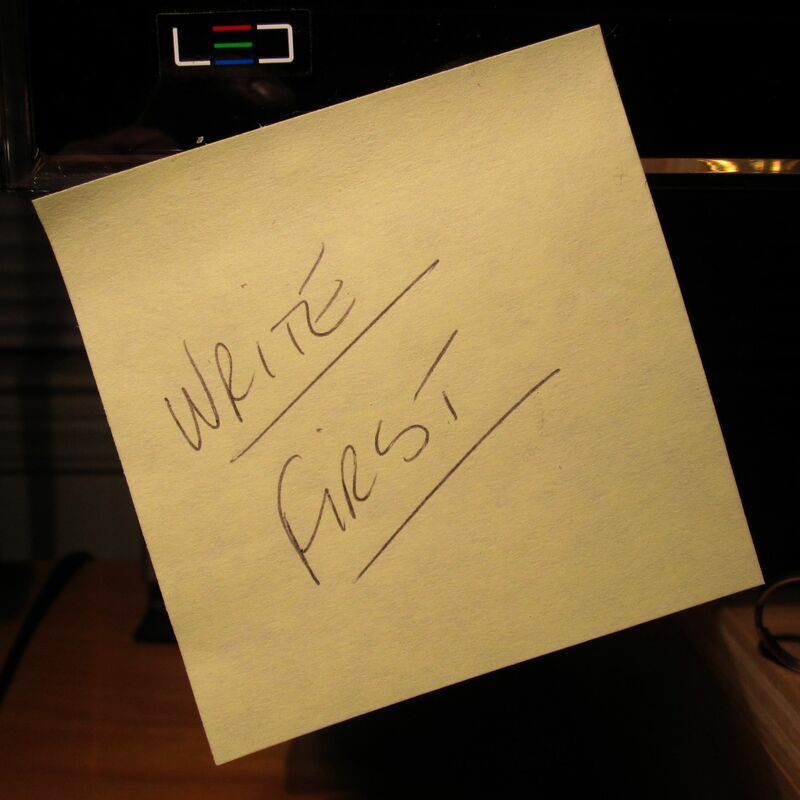 My second official ritual is to “Write First”. It may not be true for everyone, but writing in the morning is definitely the most productive creative time for me. I’ve heard it said that no good writing has ever been done on a computer connected to the Internet. Having vast resources of background research material literally at my fingertips while I’m writing is invaluable, but if I don’t “Write First”, it’s too easy for one e-mail reply to lead to an interesting news article that leads to paying bills or an idea for a new blog post and my productive, creative morning has slipped by. So identify the rituals that work for you and stick to them . . . even if you have to resort to writing them down on a sticky note. You can always tape it to your monitor after the sticky wears off!